Sometimes your customers are just a step away from purchasing, yet they lack some information about a product or want to make sure they have selected the right one. Help your customers and enlarge your sales with Questions and Answers extension. 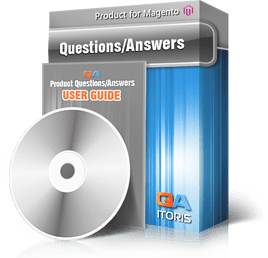 Your customers can ask questions directly on products’ pages. A good way for them to dispel their doubts. Plus ability for all customers to see questions instead of asking the same things personally. Your customers can reply questions. Let your customers help each other and share their experience and knowledge. Your guests will get privileges depending on settings. Select if your guests can see questions and answers, can reply questions. Captcha is included for such cases to avoid spamming. Your customers can evaluate questions and answers. They can mark them as being helpful, not helpful or inappropriate. Sorting and paging, great modern sliding effects. Customers can sort out questions to have more answers, to have the most helpful answers, etc. When they ask a new question or add a new reply AJAX is used. No page reloads. A sliding effect opens up additional forms directly under the list of questions. Moderation. Administrators can choose if questions and answers are approved automatically, or if they need manual moderation. Any question or answer can be edited. Administrator can add links, images, video to answers. Admin’s help. Administrators can add their own questions and answers. Use any nick you want to imitate a customer’s question or reply. Questions and Answers Management. In admin area you will have several lists so that it is convenient to administrate questions and replies. If a customer marks a question or answer as inappropriate, they also go to a special list for admin to check. Design. You will have several pre-created design schemes to meet your website better. Adding Q&A block to your website. The block with questions and answers can be included into template and become a part of product pages. Or if you use another our extension - Product Tabs Slider - make Q&A block one of the tabs so that your product pages are well-organized and convenient to read.